There are over two hundred Gemstones. 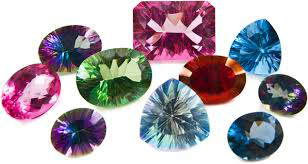 Here are list of a few commonly used Gemstones, little history and facts about the Gemstones. As some collectors who are only interested in the monetary, rarity value of Gemstones. All our Gemstones are cut and polished by us. Gemstone's quality are determined by the for C's; which are colour, cut, clarity and carat.